Planning a vacation? 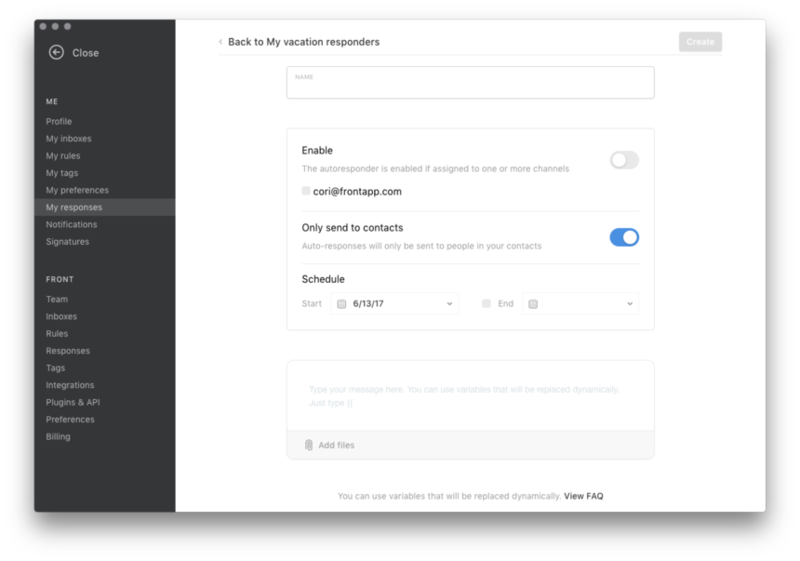 Create a vacation responder to automatically reply to your customers while you're gone. The vacation responder will send your message once per contact every 4 days. Go into your Settings, select My responses, then Vacation responders, and Add a vacation responder. Write your message and click Create. You can also use variables that will be replaced dynamically. Is there any way to add a signature to the auto replies? I would have assumed the default signature would be used, or that the signatures would be variables that were available within the reply templates. But neither of those things seem to work. Currently, signatures aren't included in auto-replies because there's no way to know who the sender is. Hi Cori Morris . The Individual responses are set per user. So surely then there should be a signature. No? Cam When you send from a team inbox, it could be anyone from the team. So, there's no way to know who is sending. Cori Morris I'm using the "Me > My Responses > Vacation responders" setting. So the system does know who the sender is. Cam Oh, a vacation responder. Sorry, I thought you meant an auto-reply via rules. Same goes with the vacation responders. You'll need to input a signature in the responder because our signatures aren't linked to these yet. Cori Morris Sorry about the confusion. I tried adding a signature to the responder, but it sent as raw text instead. How would one usually go about adding the signature? Cam There's no way to use HTML in vacation responders right now. Cori Morris I thought that might be the case. Thanks. It would be great if there was an option to switch your default signature on or off on your vacation responders. Cam Agreed! I will share this request with our product team. Thanks! Cori Morris Awesome. Thanks Cori! Hi Cori Morris is it possible to set an out of office responder for the whole team (for example when it is a public holiday) rather than having to have everyone mark themselves as unavailable before the rule works? Thanks! Marilia Salvia-Teixeira You can set a team auto responder by creating a team rule. The rule can follow a structure that looks like this "WHEN inbound message, IF inbox is X + day is saturday and sunday, THEN reply with - auto reply"
Has there been any progress on adding a feature that allows setting a signature/From name for vacation responders or Rule auto replies? Also, when sending a reply via a rule, it is adding a 2nd "Re:" to the subject line, so it says "Re: Re: Subject". Why is this? SPG We have not made any progress on this yet. It is on our roadmap, though. Regarding the "Re:" addition to the subject line, it appears we prepend our own without checking the existing subject. I'll share this feedback with the team.